Robin Youngs, Edward Fisher,	The Journal of Laryngology & Otology, Volume 129 Issue 1, p 1. A R Kumar, C Guilleminault, V Certal, D Li, R Capasso, M Camacho,	The Journal of Laryngology & Otology, Volume 129 Issue 1, pp 2-10. T Tanigawa, R Shibata, H Tanaka, M Gosho, N Katahira, Y Horibe, Y Nakao, H Ueda,	The Journal of Laryngology & Otology, Volume 129 Issue 1, pp 11-15. M M Khan, S R Parab,	The Journal of Laryngology & Otology, Volume 129 Issue 1, pp 16-22. S D Carr, D R Strachan, C H Raine,	The Journal of Laryngology & Otology, Volume 129 Issue 1, pp 23-26. G Crundwell, J Harmer, M Maltby, T Mills, C Neumann, L Walsh, D Baguley,	The Journal of Laryngology & Otology, Volume 129 Issue 1, pp 27-31. M Iseri, K S Orhan, M H Yarıktaş, A Kara, M Durgut, D S Ceylan, Y Guldiken, I G Keskin, K Değer,	The Journal of Laryngology & Otology, Volume 129 Issue 1, pp 32-37. F Aksoy, R Dogan, A Yenigun, B Veyseller, O Ozturan, B Ozturk,	The Journal of Laryngology & Otology, Volume 129 Issue 1, pp 38-45. P Singh, R Mehta, S Agarwal, P Mishra,	The Journal of Laryngology & Otology, Volume 129 Issue 1, pp 46-49. Loom bands and young children – a tragedy waiting to happen? I R M Bohler, C Douglas, S Ansari,	The Journal of Laryngology & Otology, Volume 129 Issue 1, pp 50-52. Diagnosis of incidental thyroid nodules on 18F-fluorodeoxyglucose positron emission tomography imaging: are these significant? S D Sharma, T Jacques, S Smith, G Watters,	The Journal of Laryngology & Otology, Volume 129 Issue 1, pp 53-56. M S Taha, M Amir, O Hassan, R Sabra, T Taha, M A Riad,	The Journal of Laryngology & Otology, Volume 129 Issue 1, pp 57-62. R Harris, E Ofo, D Cope, I Nixon, R Oakley, J-P Jeannon, R Simo,	The Journal of Laryngology & Otology, Volume 129 Issue 1, pp 63-67. M Acar, İ Türkcan, T Özdaş, C Bal, C Cingi,	The Journal of Laryngology & Otology, Volume 129 Issue 1, pp 68-72. H Jiang, H Cao, P Wang, W Liu, F Cao, J Chen,	The Journal of Laryngology & Otology, Volume 129 Issue 1, pp 73-78. 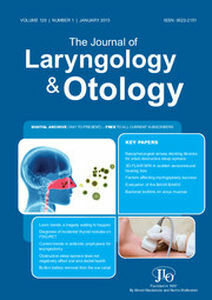 I S Kocamanoglu, S Cengel Kurnaz, A Tur,	The Journal of Laryngology & Otology, Volume 129 Issue 1, pp 79-85. E Park, K-Y Jung, S-Y Kwon, J-S Woo, J-G Cho, M W Park, I S Kim, S J Kim, S-K Baek,	The Journal of Laryngology & Otology, Volume 129 Issue 1, pp 86-92. W Nivatvongs, M Ghabour, G Dhanasekar,	The Journal of Laryngology & Otology, Volume 129 Issue 1, pp 93-94. T Yoshida, M Sone, S Naganawa, T Nakashima,	The Journal of Laryngology & Otology, Volume 129 Issue 1, pp 95-97. T Tikka, J Al Abduwani, D Costello,	The Journal of Laryngology & Otology, Volume 129 Issue 1, pp 98-100. M Nakayama, S Miyamoto, S Okabe, M Okamoto,	The Journal of Laryngology & Otology, Volume 129 Issue 1, pp 101-105. A Jain, S N Singh, P Singhal, M P Sharma,	The Journal of Laryngology & Otology, Volume 129 Issue 1, pp 106-109.